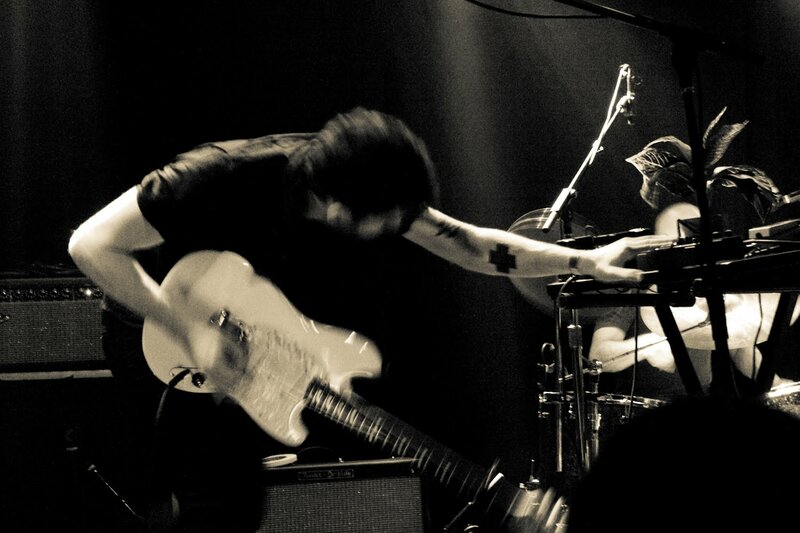 Live Review: The Antlers, 12.2 | Pulp and Circumstance, Juiced. If you’ve ever watched someone die, the wound that’s left in place of life will probably never heal. Rather, that wound will be marked by a hardened scab of proper size; one you’ve tried desperately to avoid grazing, prodding, picking, even removing. And just as The Antlers’ frontman Peter Silberman ripped into standout track “Two” (from 2009’s Hospice) last night in the Paradise, wavering between emoting with ferocity and whimpering the likes of “it opened up the scar that was just finished healing”, that scab you’d thought you kept in check, well it ripped open like a canyon. Even if you’ve never witnessed death and that horrible scab that comes with it, chances are, if you’ve ever attended an Antlers gig, you’ve had a birds eye view into what that kind of pain–the reopening of wounds–might feel like, or even how its expressed in art form. You’ll experience a remarkable euphoria akin only to the types of bands that can really transcend the time, the space; a euphoria that doesn’t exist in grief. The kind of euphoria that dances around and envelopes every bit of you, from finger to tip of toe. This is the kind of euphoria that happens to some when they fall in love. For me? It exists in the experience of relishing in a band so raw, so gorgeous, so batshit beautiful. Last night was no exception. Playing to a packed house, the band eased into tracks off their groundbreaking concept album Hospice–opening with a haunting version of “Kettering” that saw Silberman command gig goers silenced attention–before covering the goods: “Sylvia”, “Bear”, “Atrophy”, “Shiva”. The band even showered the crowd with the best live gig love there is: two brand new tracks perhaps off a forthcoming record, one which Silberman noted they’d never played for an audience before. Boasting a slightly more upbeat side of the Antlers not seen on Hospice–which chronicles the emotionally abusive relationship between a hospice worker and a terminally ill patient of which Silberman has given few details regarding–these tracks represent, perhaps, the ushering in of a new form for the Brooklyn outfit. Perhaps, too, I won’t devolve into a quiet mess of wet eyelashes on the way home from a gig. Then again, that cataclysmic emotional disaster–that bear inside your stomach–that slams into you every time The Antlers visit town, is what keeps you feeling alive. File Under: Alive and ticking. This entry was posted in jwolf, live gig review and tagged antlers, live gig review. Bookmark the permalink. ← Delicious Drip: Biting Your Tail. Pingback: New, New: The Antlers – Drift Dive. « Pulp and Circumstance, Juiced.